The Nintendo Switch has become home to many interesting art styles and interesting games that bring a special flavor all of their own. 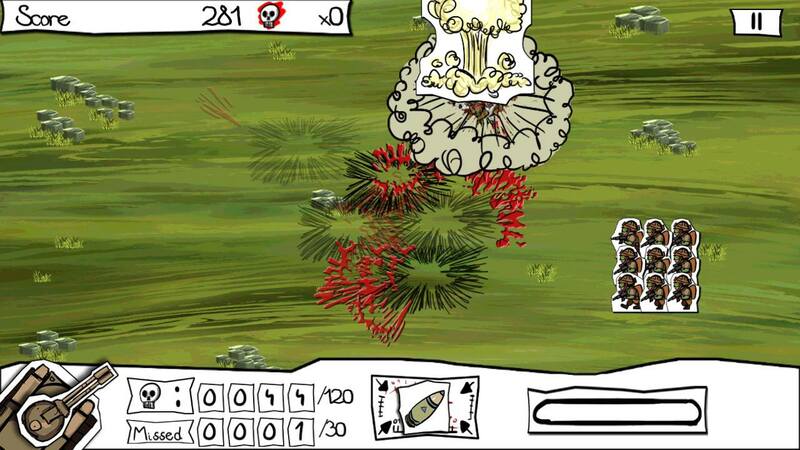 Such it is with Paper Wars: Cannon Fodder Devastated, the latest release from ifun4all. 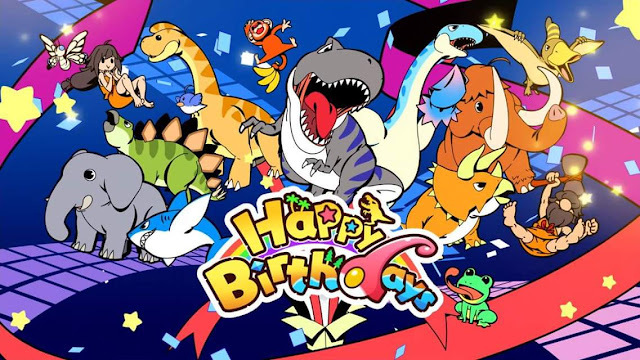 While I've previously covered the publisher's other games, they seem to offer a variety of puzzle experiences for players to work their way through, and Paper Wars breaks that mold by being an arcade game that would feel right at home in the neon filled pits that populated our malls, pizza parlors and bowling alleys in the eighties and nineties. 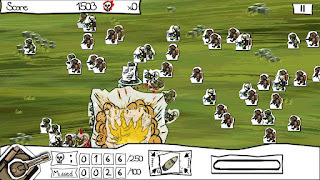 You are in charge of defending a war-torn patch of land from oncoming invaders, and the only weapon at your disposal is a fixed tank in the lower left hand corner of the screen. You are able to rotate the turret to line up your shots against the advancing enemy, and this can be done using touchscreen controls or the analog stick. Once you've settled on a target, you can then begin charging up your shot with the held press of a button or screen, and releasing that button or your finger will fire the shot. 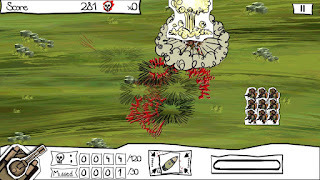 In every level, you are given a number of enemies that you need to blow up to win, and a lower number of enemies that you are allowed to miss before failure. As one-screen arcade games go, it is a simple concept, but the experience is very addictive, and loads of fun blowing up hordes of enemies. There are three different kinds of power ups that add variety to the game. There are instant effect attacks. These include things like landmines that explode the moment you trigger them, and airstrikes that...strike the the battlefield with airplanes...from the air. There are temporary use weapons that you can use whenever you like, but only as many times as you have in stock. The last group of power ups affect the game in ways such as slowing down the troops as they advance across the war torn battlefield, speed up your charge time from your turret, and reverse, which makes some of the soldiers walk backwards. 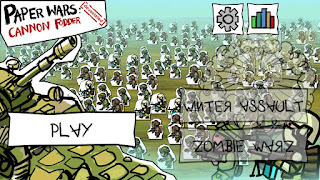 Paper Wars: Cannon Fodder Devastated presents four different modes- campaign, survival, winter assault, and zombie wars. Each of these modes presents a little bit of variety to the game play style, but survival is really just like a marathon version of the campaign. Adding in the different modes gives the game some more variety, which is a nice way of increasing the perceived value. However, switching from one mode to the other in the same play session when you've already started to grow tired of the your current mode doesn't give the game enough variety to be relied upon for longer play sessions. Paper Wars is a fun and addicting game, but it does tend to grow a little repetitive after playing for a moderate amount of time. The game play is solid, but not innovative. 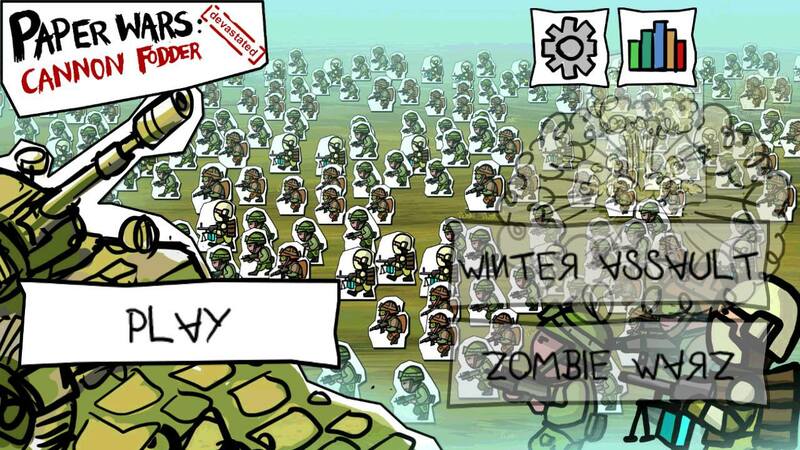 Where Paper Wars: Cannon Fodder Devastated falls a little short here, it makes up for with a charming art style. Every element of Paper Wars: Cannon Fodder Devastated appears to have been drawn and colored by a child, then cut out and brought to life. The child has even taken so much care in not harming their creations, that they leave a little ring of blank paper around them. It is a cute novelty, and they even sell this childlike whimsy by having the menus scrawled out in little kid chicken scratch, complete with misspellings and upside and/or backwards letters. 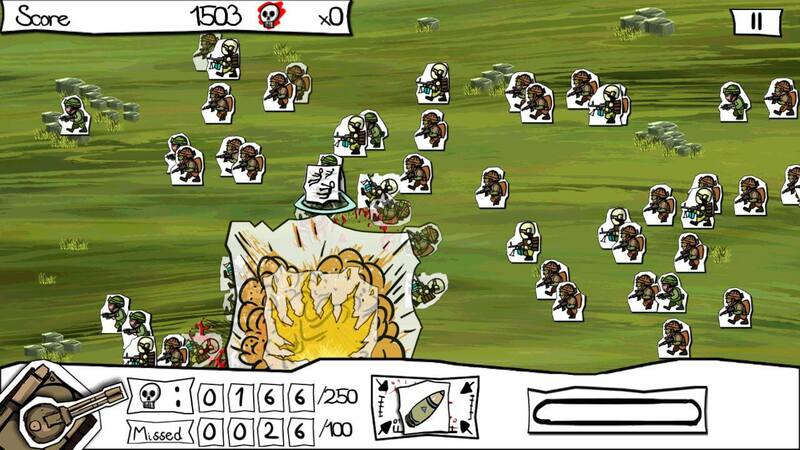 Overall, I think that any fan of tower defense games is going to enjoy Paper Wars: Cannon Fodder Devastated, even if they only do it in 10-15 minute bursts. 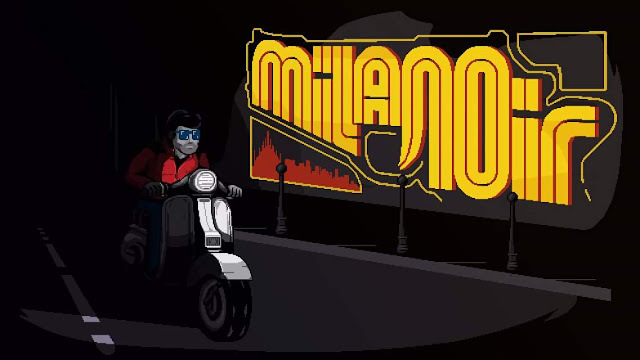 Everyone else will find some elements to enjoy, but there isn't much here to hook you once the novelty of the art style has worn off.